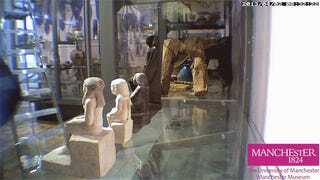 An ancient statue of the Egyptian god Nebsenu has begun spinning inside its glass case at the Manchester Museum. This time-lapse video shows the small statue seemingly rotating as oblivious museum visitors walk past—it even moves at night, when the museum is closed. Why is this ancient Egyptian statue slowly turning by itself!? @ProfBrianCox Here's that spinning Egyptian statuette you saw @McrMuseum http://t.co/M5rowvT1iY Still think it's differential friction...? The curator of the museum's acclaimed Egyptian collection, Campbell Price, has been sharing the strange tale on his Twitter feed. One of the most curious aspects of the mystery is that it did not sprout from conspiracy forums or ghost-hunting TV shows, but from the museum's own directors. After noticing "small changes" in the 3,800-year-old statue's positioning, museum staff installed a security camera to take time-lapse video. The results are, Campbell Price suggests, possibly the work of an Egyptian curse. Most Egyptologists are not superstitious people. When I first noticed that one of our Middle Kingdom statuettes (Acc. no. 9325) had been turned around 180 degrees to face the back of its case in our new Ancient Worlds galleries, I wondered who had changed the object’s position this without telling me. The Egyptians themselves would have appreciated the concern to make visible for passers-by the text on its back pillar–a prayer for offerings for the deceased. Yet the next time I looked into the case, the statue was facing in another direction–and a day later had yet another orientation. None of the other objects in the display had moved. The case was locked. And I have the only key. The statuette had always intrigued me. It entered the Manchester collection in 1933, as part of a donation of five objects from Miss Annie Barlow of Bolton–three of which at one time were considered to be modern forgeries. The inscription on the back pillar reads: “An offering which the king gives to Osiris, Lord of Life, that he may give a voice offering, consisting of bread, beer, oxen and fowl for the Ka-spirit of’. As is known for other statues of this date and type, the man’s name—Nebsenu(? )—is inscribed on the front of the statue’s base. He bears what Alan Gardiner called as “obscure” title: Hry (n) tm. The distribution of the inscriptions suggests that the statuette was prefabricated with the standard offering formula on the back pillar and that the man’s name was added later to the base.